When it comes to work, different people have different styles. Some tend to concentrate fully on their work without having any kind of distractions around them, including a beverage of their choice at the side, while others tend to need to have at least a cup of coffee or tea at the side, or at the very minimum, some water to keep them hydrated. If you fall in the latter category, you are well aware that from time to time, you need to work away from the office – and that means pulling out the laptop and getting all productive while you’re on the move. What happens when you have a Starbucks beverage in hand and want to get that proposal done while you’re at the bus stop? Placing your drink on the floor is not the most hygienic thing to do, which is where the $29.99 Laptop Beverage Holder comes in. 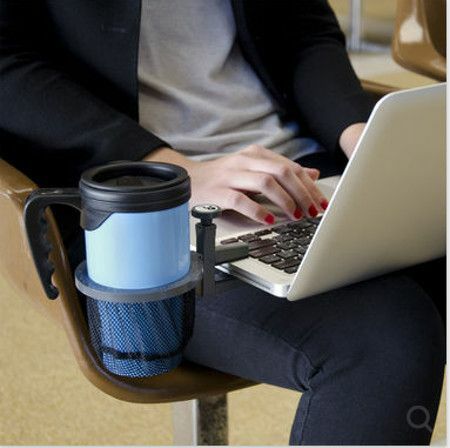 The Laptop Beverage Holder will be more serious than other offerings of similar nature in the past, where it comes in a small, strong, lightweight, patented, portable cup holder form factor which will attach quickly, easily, and safely to your laptop, or tray table, if you so desire. Being different from other lap desk designs, this particular model will be so small, and lightweight, it can be folded and stored in your shirt pocket, computer bag or purse for easy transportation. There is also a mesh bag that cradles the beverage container securely, making it ideal to use while you are looking for a place to sit your drink.